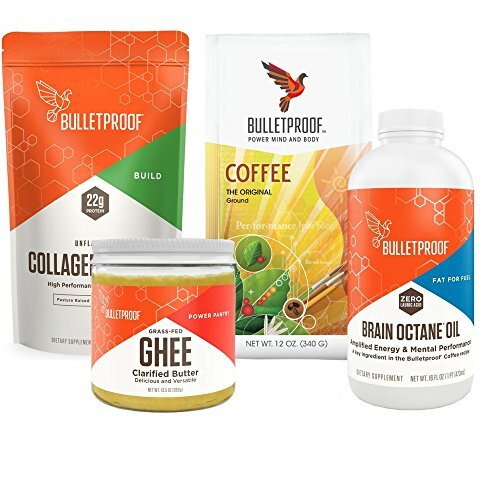 Bulletproof Coffee combines four synergistic elements to power your day: Upgraded Coffee blended with Brain Octane Oil, Collagen Protein, and unsalted grass-fed butter. Feel the difference with your first cup. Bulletproof Ghee is thoughtfully produced by slowly heating grass-fed butter over an open flame, carefully removing the moisture and milk solids resulting in pure, clarified butterfat that preserves only the best parts of butter. Naturally gluten-free, Grass-fed Ghee is the perfect expression of buttery goodness. The proprietary Bulletproof Process optimizes every step of coffee production for performance by minimizing the opportunity for performance-robbing toxins. Bulletproof® Upgraded Coffee Beans are meticulously grown at high altitude on single estates in Guatemala, hand-harvested, carefully processed, and roasted to maintain maximum integrity and flavor. Brain Octane is naturally found in coconut oil in small quantities, and we concentrate it to provide you with the purest energy source possible. Brain Octane rapidly provides mental and physical energy, powering your day by supporting cognitive function and keeping you satisfied and free from food cravings. Fortify your skin, nails, hair and joints with Bulletproof Collagen Protein which makes it easy to get the same vital amino acids found in bone broth. And because collagen is flavorless and blends in quickly without clumps, it’s one of the easiest ways to add a protein boost to smoothies, soups, and of course, Bulletproof coffee. Upgraded Coffee is third-party tested to meet stringent Bulletproof standards. Blend with ghee, brain octane oil, and ground coffee for improved performance and energy. If you have any questions about this product by Bulletproof, contact us by completing and submitting the form below. If you are looking for a specif part number, please include it with your message.